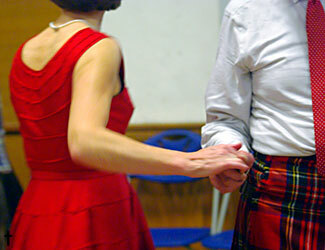 The Little Ship Scottish Dancing Club was started 40 years ago at the Little Ship Club in the City of London, and while keeping its name is now based in St Columba's Church, Pont Street, Knightsbridge. Our MC is Peter Knight, who edited the Collins "Scottish Country Dancing". The Club is essentially a social Scottish country dancing club for those who like a variety of reeling and strathspeys, sometimes including the twelve well-known dances found at most balls. We welcome new dancers, though it may be helpful if you have some idea of the formations. The dances are always walked through and people are more than willing to help those new to the Club. We have a picnic during the break when attendees are encouraged to bring a light snack. The evenings are fun, good exercise and we often dance to live music.